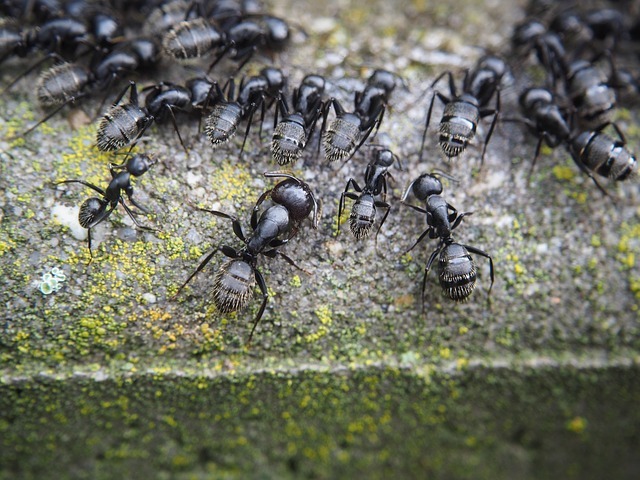 Pavement ants are increasingly becoming one of Vancouver’s major pest problems! They are cousins to the carpenter, pharaoh, and moisture/cornfield ants that we get a lot of calls for extermination. While the pavement ant is more of a common sight in Europe, it is gradually becoming more of a pest in North America as well. The pavement ant’s favourite location to nest in is very obvious: under pavement, in the cracks between stones on driveways, inside hollow foundation walls, and through tiny cracks and gaps in the foundations of houses, commercial buildings, and construction sites. There are minor differences between the pavement ant and its cousins it’s mistaken for, specifically the carpenter and house ants. Pavement ants’ bodies are dark brown to black in colour. They also possess stingers unlike the carpenter ants (don’t worry though, they rarely bite or sting humans!). What’s really bad about these ants is their waist is capable of contaminating food, so definitely hide and cover up those burgers you’re trying to barbecue! Speaking of food, did you know the greasier the food is, the more a pavement ant will love it? Greasy foods such as meat, living and dead insects, and grease itself are the primary food sources for this type of ant. They will deliberately set up trails from their nest to the food source and then continually forage from there to feed their colony. Certain members of pavement ant colonies are winged ants too, much like their carpenter cousins. Queens of the pavement colonies will produce wingless workers as well as winged queen and male ants, which are often referred to as swarmers or reproductives. That means these ants tend to get busy while airborne, unfortunately ruining several outdoor picnics in the process. What makes eradicating pavement ants so difficult is the fact that there is more than one queen who rules over the colony. This means once you’ve spotted a nest in one area, there are likely to be dozens more nests around that are invisible to the naked eye. These are major pests that can destroy the foundation of your beautiful home or bring your construction project to a halt. If this sounds like your current pest problem, give us a call at Pest Boss. We’ll get you, varmints!